Handmade in the USA this lead-free pewter coin is a unique, masculine and meaningful godfather gift. Our 1" round coin reads, "Godfather you are Loved", a daily reminder of how special and important he is in the life of his godchild. Whether carried in a wallet or kept at a bedside or desk, the pewter coin and beautiful sentiment card will be something to treasure. 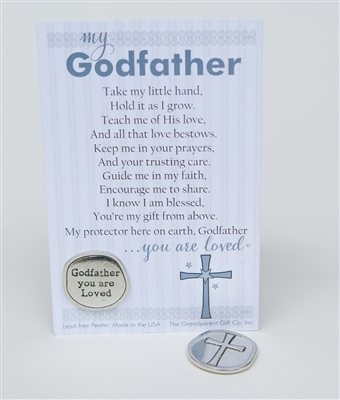 A one of a kind gift and message a godfather will hold on to An ideal godfather gift for a godchild's Baptism or Christening Day, Father's Day or any day you want her to know how much he is loved. If you loved our pewter coin, please see our godfather frame (5325),also featuring our handmade pewter coin.